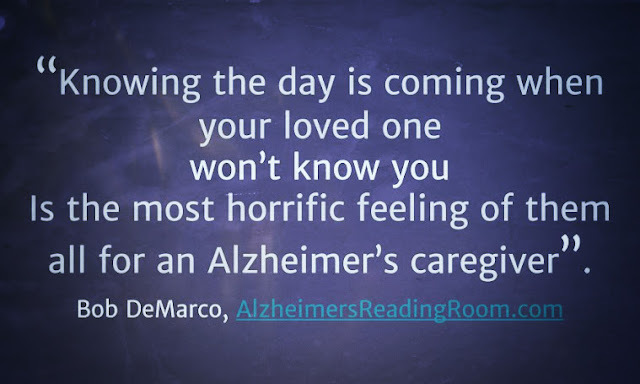 Knowing that the day is coming when your loved one -- won't know you-- is the most horrific feeling of them all for an Alzheimer's caregiver. I often use the term "living Alzheimer's from the front row". This term describes caregivers that watch Alzheimer's take its course 24 hours a day, 7 days a week. Once Alzheimer's disease strikes, Alzheimer's caregivers get to witness the craziness that comes with Alzheimer's day in and day out. If you think it is disconcerting to see someone living with Alzheimer's or a related dementia for a few hours, a few days think about what it might be like -- for every hour of every day for years. Most people give up trying to understand Alzheimer's disease. Why? Because Alzheimer's is difficult to think about. Most people sitting in the back rows don't want to think about Alzheimer's. It is too painful. They'll leave the thinking and doing to the person sitting in the front row. On one hand, you have the person that has Alzheimer's disease; on the other hand, you have the person responsible for caring for that person -- the Alzheimer's caregiver. The caregiver is responsible for the safety and care of the person living with Alzheimer's. They are also responsible for their own emotional and psychological well being. A dual burden. Alzheimer's kills the brain of the person suffering from Alzheimer's. It will also try and kill the brain of the Alzheimer's caregiver. I doubt that many people know or understand this burden. If they knew or understood they would move up a couple of rows. Get out of the back row -- maybe. Did you ever sit in the back row at a play? Every sit in the front row at a play? The view is very different. Unless you are an Alzheimer's caregiver it is difficult to understand or comprehend what it is like living in the front row. The behavior. The illness. The death sentence. Why are their so many empty seats? Until you sit in the front row you won't be able to comprehend what it is like living in the "front row". In the early days of caring the caregiver deals with a disease that is difficult, sometimes impossible, to understand. Alzheimer's disease turns the world of the caregiver upside down. Imagine a person you know all or most of your life and their behavior changes-- suddenly -- and for the worse. This person, your loved one, begins to act out behaviors that you have never seen or experienced. You are forced to try and deal with these behaviors. It is not easy. When a person hears something that is mean or nasty they usually react in anger. This is a normal behavior -- the "norm". Using these behaviors helps you cope. This is the way you have been coping your entire life. No one wants to be treated harshly. The typical Alzheimer's caregiver is bombarded with mean spirited behavior over and over. Since they are made of flesh and blood they often feel angry, frustrated, and sad when it happens. There is nothing wrong with these kinds of feelings. When an Alzheimer's caregivers decides to strike back in the form of an argument, or an equally harsh behavior they soon learn that not only does this make matters worse, the person living with Alzheimer's often goes into a shell. Alzheimer's sufferers, as the disease progresses, lose the ability to forgive, apologize, or make-up. The words, actions and behaviors of the person living with Alzheimer's are often a product of the disease, rarely a product of intentional thought. Alzheimer's caregivers need to learn to understand that Alzheimer's behaviors are a product of the disease. The typical responses that caregivers have been making over the course of their life -- coping, the "norm" -- won't accomplish anything other than worsening the situation in Alzheimer's world. Caregivers need to work on new coping strategies, and developing new "norms" of behavior. When Alzheimer's caregivers "fight back" they usually ends up suffering from another array of negative feelings -- guilt, blame, inadequacy, and the ultimate worst -- depression. 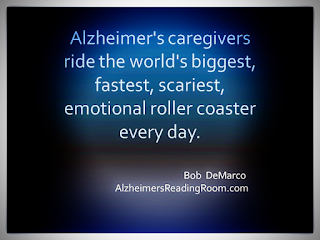 Alzheimer's caregivers when pushed to the edge often feel like screaming. Caregivers soon learn that this behavior won't work. Caregivers gradually come to the realization that this only makes matters worse -- much worse. You cannot reason with a person living with Alzheimer's disease. They believe what they say to be true and nothing you say will can change it. It usually takes a long time before caregivers learn this lesson. The lesson -- it is up to the caregiver to make the necessary changes. To change the dynamic. It's all on you caregiver. Sooner is better than later. A typical caregivers goes on for years trying to hold a dialog or use conventional reasoning to deal with someone living with Alzheimer's. The problem with this scenario is that it takes two rational persons to hold a dialogue, and two rational persons to reason with each other. Alzheimer's robs the sufferer of the ability to think clearly, reason, and remember. They can't continue to argue with you if they don't remember why they are arguing about. They can't apologize for their behavior if they don't remember the behavior. They can't. Why engage in these behaviors? You are arguing with yourself. Don't. It is difficult to describe the range of emotions a caregiver might feel or experience in a single day. Imagine being happy and then sad, caring then angry, focused then frustrated, an almost endless stream of feelings and emotions that conflict. The caregiver lives an anxiety filled life day-after- day. Imagine being bent out of shape emotionally. Disconcerted. Confused. How does that feel? Imagine being on the world's biggest, fastest, scariest roller coaster. How is your day going? Care to jump aboard the rollercoaster? Tickets are free of charge. Front row seat. 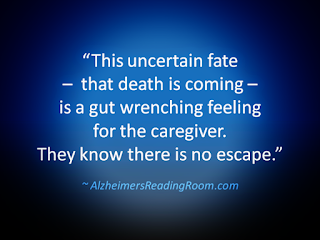 Alzheimer's caregivers never know when their life filled with chaos will end. Typically if you were living in a difficult environment you would want to put those difficult circumstances behind you. As an Alzheimer's caregiver you can't. The Alzheimer's caregiver lives a life that is filled with negativity. The negativity comes in in many shapes and forms. The illness -- the gradual or fast decline -- of the brain health of the person living with Alzheimer's, medical problems and set backs, financial problems, and the most gut wrenching of them all -- the realization that death is coming. Her is one aspect that is rarely considered. Regardless, of circumstance the Alzheimer's caregivers becomes attached to the Alzheimer's sufferer. This emotional attachment is a result of the day in and day out caring. The bond. Like super glue. Most people have difficulty dealing with change. The Alzheimer's caregiver gets change whether they like it or not. Never knowing for certain what is coming, but knowing fully it is coming. Informed caregivers try to get ahead of the curve so they can get prepared for these harsh, sometimes hard to comprehend changes. Knowing that your loved one is going to forget simple things like how to brush their teeth, how to take a shower, and even how to eat is not a pleasant thought. The actual experience and feeling of helplessness cannot be described. This is life in the front row. It isn't pleasant living in the front row. Yet, somehow we do it. Most of us for years. Trust me when I say this, if you are not living in the front row you could never imagine what it is like. If you can't or are unwilling to come to the Front Row there are some things you can do. If you know a caregiver get involved. The first thing you can do is listen to them as they vent. Venting should be as natural to a caregiver as breathing. They can either vent to a real life human being, or they can hold it in. Holding in leads to a natural outcome -- depression or worse. I am not interested in writing about worse. One thing you can do is arrange for an Alzheimer's caregiver to get away from it all. Go to the supermarket. Buy a bag of gumdrops. Every time you arrange for an Alzheimer's caregiver respite -- eat a gumdrop. When you get to the last gum drop eat it. How did it taste? This will let you know how you are doing. Try hugging a caregiver -- tightly, real tight, tighter. I assure you it will be an experience you won't ever forget.